The wide variety of cars available on the market today gives most drivers more choices than ever before in terms of their next vehicle purchases. That said, compared to some other vehicle models such as sedans, pick up trucks, and sports cars, SUVs offer many hard to ignore advantages. Some of these major advantages include heightened safety options and significant towing capacities. Most modern SUVs are built to larger than average specifications, and this extra size comes in handy in many situations. The extra weight and the extra size factor can make SUVs more stable on icy, wet, or otherwise low traction roadways. Extra weight can also come in handy during vehicle on vehicle accidents, with larger cars often faring better than smaller ones. 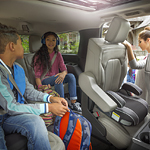 In addition to their size advantages, many modern SUVs come with a raft of safety features. Examples of some of these features include rear facing cameras, traction control support, and driver alert systems. In addition to internal systems, many SUVs also come with robust external towing capacities. As such, features such as high-capacity brakes, towing hitches, and specialized electronics often come as part of the package. These features allow many SUVs to tow vehicles, sports equipment, or trailers laden with goods.